Once again, JSP have come up with another highly important collection of American Old-Time recordings and now, thanks to Chris King's transfers, this music made in Richmond, Indiana and New York for the Gennett Record Company, sounds better than it ever did on previous very hard to find issues. The set opens with John D Foster's swinging guitar booming out loud and clear on old time ballads, upbeat blues and fiddle breakdowns ably assisted by his various outfits which included mandolin players Jesse James and TS Young and the legendary fiddler Leonard Rutherford. The tracks with Rutherford are particularly good - especially the stop-time gospel number These Bones Gonna Rise Again and the jaunty instrumental Taylor's Quickstep. The Red Fox Chasers set includes wild instrumentals like Turkey In The Straw and Did You Ever See The Devil, pathos filled ballads such as Wreck On The Mountain Road and Naomi Wise then the tough, rural harmonies of Something Wrong With My Gal and May I Sleep In Your Barn Tonight, Mister? 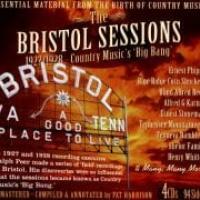 The full Gennett sessions may be available elsewhere but these 22 tracks present a fine selection of their very best songs. I knew nothing of vocalist and banjo player Oscar L Coffey but his solo performances of the ultra rare Six Feet Of Earth and Dear Old Mountain Home come from the deepest of the darkest mountain hollers. He made a bunch of stuff for Gennett but only three were ever released. Previous issues of Fiddlin' Doc Roberts have been marred by bad sound quality so his 14 tracks here have benefitted hugely from the Chris King treatment. Doc's songs are marvellous virtuoso pieces and, accompanied by his trusty sidekick Asa Martin on note-perfect guitar, the adventurous and inventive fiddle playing is a joy to hear. His interpretations of tunes like Old Buzzard, The Devil In Georgia, Arkansas Traveller and the square dance Martha Campbell have, in my opinion, never been bettered. If like me, you're fan of high kicking fiddle instrumentals, Tommy Whitmer's tremendous swinging version of Fire On The Mountain is another worth special mention but is really just one more great performance on a set of CDs that is crammed with great fiddlin' by some of the best. I also have to mention Da Costa Wotlz's Southern Broadcasters who had a gem of a fiddler in Ben Jarrell who fairly set the furniture alight in most of their 12 tracks here. He never lets up on dance tunes like John Brown's Dream and goes hell for leather on the minstrelsy version of Yellow Rose Of Texas. How he found the energy to sing as well as play at this speed is one of life's mysteries! This really is a treasure trove for old-timey fans. Just the kind of set you can dive in anywhere and find real diamonds amongst the gold. 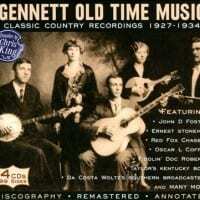 Although best known for its jazz releases, Fred Gennett’s self-named Gennett Records label also did extensive recording in the rural folk genre, tracking various singers and string bands from the South in the 1920s and 1930s. 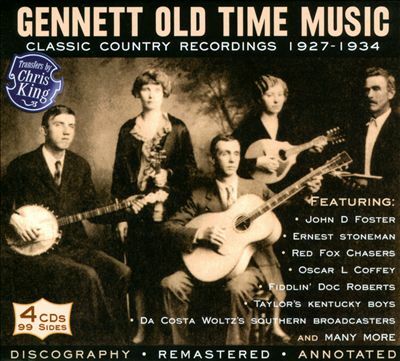 This expansive four-disc set compiled by Chris King collects nearly 100 of these rare sides issued between 1927 and 1934, including early recordings by Ernest Stoneman, the Red Fox Chasers, Fiddlin’ Doc Roberts, and a trio of lovely clawhammer banjo pieces from John Hammond. Modern country grew out of these kinds of back-porch performances, and what they lack in polish and sleekness they more than make up for with pure heart and soul.